Amazon.com description: Product Description: Offering numerous real-world examples and case studies, MANAGEMENT OF ELECTRONIC AND DIGITAL MEDIA, 6e, equips you with the latest trends, practices, and research on the management and leadership techniques used in the electronic and digital media industries. Extremely reader friendly, the text offers a clear and concise presentation of key issues facing future managers, leaders, and entrepreneurs in the rapidly evolving media industries. New coverage highlights trends in big data, mobile, social media, and the cloud, as well as the latest on the evolution of social media and digital platforms. An all-new chapter details the multifaceted manager/leader/entrepreneurial role of a media manager. Giving you hands-on experience with real-life challenges, end-of-chapter case studies put you directly in the role of decision-maker -- helping prepare you for a career in today's electronic and digital media field. About: Offering numerous real-world examples and case studies, MANAGEMENT OF ELECTRONIC AND DIGITAL MEDIA, 6e, equips you with the latest trends, practices, and research on the management and leadership techniques used in the electronic and digital media industries. 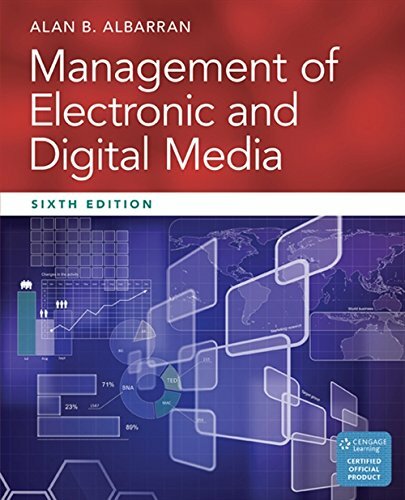 About: MANAGEMENT OF ELECTRONIC AND DIGITAL MEDIA, 5th Edition, provides the most accurate and current information on the management techniques used in the electronic and digital media industry. With George L. Grice | 2 edition from Allyn & Bacon (June 1, 1995); titled "Mastering Public Speaking/Webster's New World Thesaurus"